Vermont's Green Mountain Power set the environmental bar high on the 63 MW Kingdom Community wind project, including an alternative storm water project design that better fits the site's topography. Although wind power by nature is earth friendly, utility company Green Mountain Power (GMP) recently went the distance and then some, installing a novel storm-water-treatment system as part of its 63-megawatt wind farm along a Vermont ridgeline to further protect the environment. "We certainly set a very high bar to meet strict environmental standards," said Jeff Nelson, a consultant with Vanasse Hangen Brustlin Inc. (VHB) of North Ferrisburgh, Vermont, which designed the water system. Despite this and other steps GMP took to minimize the project's impact, you can't please everyone, as the saying goes. A small group of residents continue to complain, even to this day. "In Vermont, any kind of building project has controversy and is discussed at great length," said Dorothy Schnure, GMP corporate spokesperson. 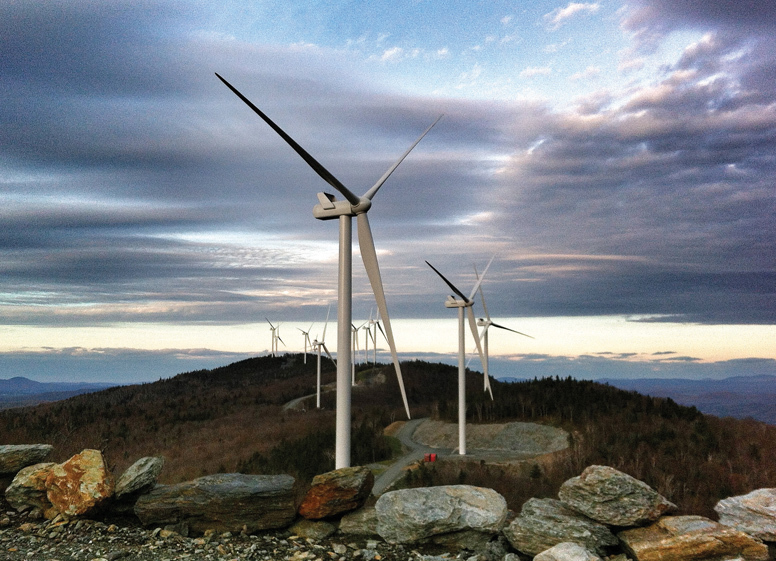 The Kingdom Community Wind project actually dates back about 10 years when another company began looking at the Lowell Mountain ridge for wind power, said Josh Castonguay, GMP director of generation and renewable innovation. For whatever reason, the company didn't move forward. The landowner approached GMP more than six years ago about getting involved in a similar project, and the utility was able to take advantage of the wind studies already conducted for the site. Mountain Ridge in Lowell, Vermont, also allows the utility to help meet the combined challenge of low costs and low carbon posed by Mary Powell when she became the company's chief executive officer. "We want a power supply for our customers that's low cost, low carbon, and reliable," Castonguay said. "One of the best ways we can obtain cost-effective renewable energy is to own it. "This project is the lowest cost, new renewable resource available to our customers. And we wanted to ensure residents who live near the project also benefit, so we sell some of the power at our cost to the local utility—Vermont Electric Cooperative (VEC). All of the power from the project goes to Vermonters—customers of GMP and members of VEC." Colchester-based Green Mountain Power, a subsidiary of Gaz Métro, of Montreal, Quebec, is the largest utility in Vermont, serving 72 percent of the state. Early on, GMP conducted several environmental studies, including sound, wildlife, and aesthetics, so officials would have data in hand when they applied for permits. Utility officials also conducted extensive public outreach in the towns around the Lowell site. "We received positive feedback from that, and that was important to us," Schnure said. Officials also met with town leaders to seek their approval. "We said to the town of Lowell, 'If you don't want us, then we won't build it,'" Castonguay said. The Lowell select board—similar to a town or city council comprising elected representatives—decided the best way to determine whether the town wanted the project was to hold a town vote. The town meeting drew the highest turnout ever, and 75 percent of those attending favored the project. It was only after it won local support that GMP applied to state regulators for permitting. "And we also decided to raise the bar in what we were proposing as far as environmental standards," Castonguay said. In addition, the utility established a good neighbor fund to ensure that surrounding towns received economic benefits from the project. The environment was always at the forefront throughout the planning process, said VHB's Jeff Nelson. "As the project designs were developed, we had to figure out how to meet the purpose of the project but at the same time, minimize the amount of clearing of the forest and minimize disturbance of existing terrain," he said. A key part of that was the design of the storm water system. All of the runoff from access roads and crane paths along the ridge had to be treated. Vermont requires the traditional approach, which would use large detention basins. The challenge with that type of approach, Nelson said, was the basins would require additional tree clearing and disturbances, and they wouldn't fit the topography. Instead, GMP worked with VHB and the Vermont Agency of Natural Resources early in the project to develop an alternative storm water project design that would better fit the topography and better mimic natural hydrology, he said. The final project included 14 small storm water collection basins and 31 level spreaders. The level spreaders actually are a two-part system that involves a 30 to 150-foot-long trench dug perpendicular to the slope and a forested vegetative buffer of 150 feet on the lip of the trench down slope. Depending on the rate of inflow, the water in the spreaders eventually flows over the lip, then spreads out within the vegetative buffer below. The vegetation slows the flow, allowing it to be absorbed into the ground. "And it's further treated through the natural soil before going down slope and ultimately into the streams," Nelson said. Altogether the smaller collection system allowed for about 12 fewer acres of forest clearing and earth disturbance than what would have been required for the more traditional large detention basins, Nelson said. Because this is the first time a system like this has been used to address storm water treatment in Vermont, he said GMP agreed to conduct a long-term performance study. "We're interested in making sure that everything is working and there are no surprises," Nelson said. "This goes far beyond what other applicants are required to do. If there were to be an issue with the system, it would be reworked and changed to a different type of system. So far everything is looking very good. We're pleased with how the system is operating at this point." Forested areas were cleared for roads and turbine pads, and Castonguay said it was done in a way that required little fill to be hauled in. J.A. McDonald Inc. of Lyndon Center, Vermont, constructed the staging area and access roads in the foothills of the mountain range. GMP also worked closely with the Vermont Agency of Transportation to coordinate hauling the components through various towns and eventually up the mountain. Blades and towers were transported via rail from the manufacturing sites in Colorado to off-loading sites in Island Pond, Vermont, where they were transferred to tractor-trailer rigs. The rigs hauled them to the lay-down site at the base of the mountain, where they were transferred to a different tractor-trailer set-up, which hauled them to the mountain top. Nacelles were shipped from Denmark, where Vestas has another manufacturing facility. Woolwich, Maine-based Reid & Reid Electric Inc. acted as the general contractor, orchestrating the entire turbine erection and blade installation. Concrete foundations were pour-ed, long anchor holes were drilled into the bedrock, and tower bases were bolted in place. A smaller crane stacked the first two pieces of the tower. A taller crane was then brought in to stack the third piece of the tower as well as the nacelle. The blades were then attached one at a time. "It's a pretty choreographed process," Castonguay said. Each tower is 86 meters to the hub, and each blade is 56 meters long. From the ground to the tip of the blade, each unit stands about 140 meters or 459 feet tall. 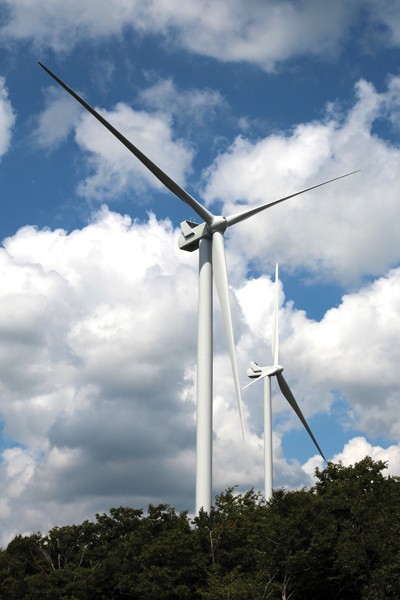 Bates & Murray Inc. of Barre, Vermont, did much of the electrical work inside the turbines. Multiple contractors also worked to build a collector system that runs down the hill and 46KV transmission lines. The lines were installed underground alongside the road along the ridgeline, so they would be visible and would be protected from significant ice build-up that could occur on the mountain, Castonguay said. Altogether, 18 miles of transmission was constructed and about five milesof underground cable laid along the ridgeline. He said local labor was used whenever possible. As mentioned, a portion of the power is sold to the Johnson-based Vermont Electric Cooperative, which had identified a transmission line that needed to be upgraded in a number of years. Through a partnership, GMP paid for part of the upgrade and will be sharing in a portion of the maintenance for 25 years, allowing the co-op to move more quickly on a more robust upgrade, Castonguay said. Construction began in August 2011, with the first foundation being poured in December 2011. The first turbine arrived on July 20, 2012, and all of the turbines were commercially operating on November 16, 2012. ISO New England has identified an additional piece of equipment that GMP needs as the final step in the interconnection to the grid. Once installed by the end of 2013, it would help stabilize voltage in that area of the state. Since completion, GMP has hosted tours as part of permit requirements for public education, Schnure said. By the end of the summer, more than 1,000 people had visited the project. "The best way to educate the public is to bring them up and see it, particularly because of some of the controversy, and there's a lot of misinformation," she said. "We can bring people up, and they can see and hear for themselves what the turbines are like." In this case, a small group of people actively opposed it originally. Some of them participated in the regulatory review process, where the regulators took their testimony and reviewed testimony from their expert witnesses. After an intensive one-year review, the project was found to be in the public good. But the group continues to oppose it, Schnure said. Nevertheless, multiple opinion studies show the vast majority of Vermonters support wind development in the state. The Certificate of Public Good included many requirements, such as maximum noise levels. "We have very strong standards we need to meet," she said. For example, noise from the turbines cannot exceed 45 decibels outside nearby homes, which is similar to background noise within a library. The closest house is more than a half mile from the farm, and several are within 1.5 miles. One of the requirements is that for two weeks each season during the first two years, GMP must take noise readings in four different locations to obtain baseline sound levels. During the continuous monitoring, the turbines shut down for 20 minutes every four hours to determine what sound is created by the turbines and what are normal background sounds. "It's a very sophisticated, professional analysis," Schnure said.